Filipino scientists are equally as competent as foreign scientists, but this notion is not acknowledged by many, especially ourselves. Consequently, students are more familiar with foreign ideas and discoveries and marvel at our very own innovation when they are enumerated in class. This paper aims to describe the life of a Filipino scientist with who not only contributed a series of scientific discoveries locally, but expanded the universal language of science on an international scale. We strive to give him the respect and attention he deserves for his various discoveries, improvements, and establishments in the various fields of science. Dioscoro L. Umali who is also known as “Diosing”, “DLU” and “Jack” was born on the 17th of November, 1917 at Biñan, Laguna. He is known to be the Father of Philippine Plant Breeding. He specialized in the breeding of rice, corn, abaca, and mussaenda. In his early age, he was already open to a less fortunate life. His father, Captain Cesario Umali, was a sailorman. Cesario voyaged to Spain and never returned back, he left his home and family behind, and died of sickness in Barcelona which even up to now his remains still lie there. Ediliberta Gana-Lopez, his mother, had to play a vital role in being both father and mother to raise Dioscoro and his two-year-old brother, Telesforo by selling rice in the market. Their mother went to the Calamba market at the break of dawn to buy and sell rice for a living and the boys would be her “baggage boys” or kargadors. Neither heavy lifting nor kalesa driving bothered the boys, but it was the difficulty of collecting money from their mother’s debtors. It is mentioned that their businesswoman of a mother was so generous that she extends the credit beyond limits. His mother was truly a hard-working woman and was considered to be phenomenal by many of their family friends. Ediliberta was perceived to be a high-minded leader because she knew what she wanted, she was decisive, committed and had a positive vision which she translated into actions. These valuable characteristics of his mother, influenced him to be like one. He is married to Zenaida Lopez-Umali, second child of then 4-year Los Baños mayor. They have five children. In 1981, they have a residence in Bangkok, Thailand. Before, it was required that one must be a graduate of a Manila elementary school for one to enroll in a Manila public high school. So his mother, Edilberta arranged for Dioscoro to attend Rizal Elementary School in Tayuman Street. In his early years, he was actively participating in different activities such as singing, folk dancing and student affairs. He completed his secondary education in Manila West High School, formerly Torres High School. He enjoyed joining singing, dancing and acting school contests and developed an interest in public speaking. Despite being the youngest in class and actively participating in all his extra curricular activities, he completed a four year program in three years. While still in high school, Dioscoro was already planning the course of his life. Like his father, Captain Cesario Umali, the young Dioscoro hoped to follow his career in the navy. But unlike his father, Dioscoro desired to qualify for the United States Naval Academy instead of the Philippine Nautical School, his father’s alma mater. This dream was well within reach for Dioscoro was a man with vigor, brilliant and physically fit, but his aunt Filomeno Gana offered to send her nephew to the University of the Philippines College of Agriculture. After Captain Umali sailed to Spain and never returned in 1921, his mother was more favorable towards a career path near home and therefore, pursued studies in Los Baños. After graduating, he joined UPCA as an assistant instructor in chemistry. He quickly accelerated to superintendent of the College Experiment Station until the outbreak of World War 2. In 1946, UPCA sent DLU to Cornell University to pursue further studies as an undergraduate student, but in a hurry to come home to his wife, he was allowed to skip the master’s program, finishing in two years and three months. In his return, Umali organized the Division of Plant Breeding and developed plant breeding into a blossoming science as its first head in 1948. He has also established the breeding of the Mussaenda species, the yellow-orange Doña Amelita (named after First Lady Mrs. Amelita Martinez-Ramos) being its most recent addition. Mr. Umali also improved the abaca resistance to diseases and increasing pulp and paper quality by cross-breeding it to abaca relatives. In addition, Mr. Umali also improved rice and corn dramatically; he altered corn to suit Philippine conditions and by 1958, this has produced 14 excellent rice types and 5 corn hybrids which earned the approval and recommendation of the Philippine Seed Board. UPCA was awarded with P200, 000 as a research aid to improve the rice and corn program from the National Rice and Corn Corporation (NARIC). This was the first significant financial aid of UPCA for research. Moreover, Dioscoro Umali delved into more research and fieldwork and enriched local fruit germplasm and consequently the fruit industry with varieties of rambutan, durian, citrus, mangoes, tamarind, jackfruit, atis, manzanilla and coconut. The DLU Maharlika, a kind of rambutan personally selected by Mr. Umali himself is sweet, juicy, meaty and tuklapin or easily peeled from the seed. He also recommended the culture of the macapuno embryo to grow into maturity to enable the production of macapuno nuts by controlling the tree pollination. According to Professor Janet Reguindin, not only is Dr. Umali is known to be one of the most well-known deans of the College of Agriculture, (located in the Los Baños campus of the university), he is also globally recognized. In fact, some buildings of international research centers are named after his honor such as the DL Umali Laboratory Hall of Southeast Asian Regional Center for Graduate Study and Research in Agriculture (SEARCA) and DL Umali Hall of International Rice Research Institute (IRRI). Outside the academe, he founded and became first president of the Association of Colleges of Agriculture in the Philippines also known as ACAP, established the Social Laboratory at Pila, Laguna, initiated community projects in Tanauan, Batangas and Bulacan. In 1969-1971, he was also vice president for UPLB and vice president for Agriculture and Forestry Affairs for Los Baños units in his remaining years as dean. He organized the National Rice and Corn Cooperative Improvement Program which centralized nationwide research on rice and corn. He was a Board of Trustees member of SAMAKA Service Center, a non-profit organization in service to the local farmers, Cadang-cadang Research Foundation, and the Philippine Rural Reconstruction. During the 1960’s, he was also the chairman for the National Food and Agriculture Organization (FAO) Committee, and for the Board of Trustees of the Ramon Magsaysay Award Foundation. He was also a member of the panel in the Reorganization of the Office of the President of the Philippines. During his time as the Agriculture Undersecretary, he was also the chairman for a presidential committee that created the rice and corn program of the country which led to the nation’s self-sufficiency in rice for two and a half years after half a century of being a rice importer. He was also part of the panel that negotiated for America’s reparation payment to the Philippines for the World War II. He was also the vice chairman of the Presidential Action Committee on Social Justice and Reforms (PACSJR) and a “permanent moderator” between the PACSJR and the Federated Movement on Social Justice and Reforms (FMSJR) on the goal of solving the problems of small farmers. He also became a part of the Board of Advisers of the Farmers and Friends, Inc. of the Philippines in 1979. He returned to Los Baños in 1982 and created and became the chairman of the Los Baños Rural Bank to help small farmers in getting credit. The Los Baños Rural Bank was also recognized as the number one rural bank in the Philippines. In addition to this, he was also became the chairman of multiple organizations such as the Cooperative Union of the Philippines for Small Farmers, Ramon Magsaysay Awards Foundation Board of Trustees and the Asian Non-Governmental Organization Coalition for Agrarian Reform and Rural Development (ANGOC), which he served for five terms (1983-1992). He was also appointed by President Marcos as one of the first ten top scientists as an Academician of the National Academy of Science and Technology which he was elected as a president in 1989. In the 1960’s, he concurrently was the dean of UPCA, the vice president of the agricultural and forestry affairs for the UP Los Baños units, director of SEARCA and the undersecretary of agriculture and natural resources. He became the a member of Asian Development Bank’s Asian agricultural survey consultative committee because of the $200,000,000 special fund for Southeast Asian agricultural development he authored. 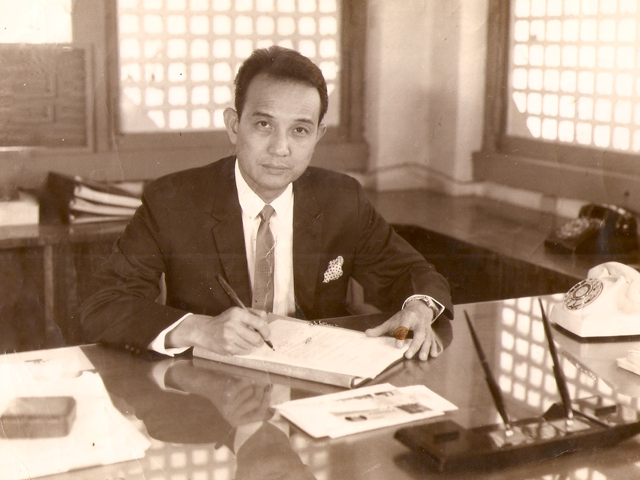 During the second world food congress in 1968, he was the head of the Philippine delegation and became the chairman of of Commission III (People in Rural Development). He was also a member in the governing boards of the International Institute for Tropical Agriculture and in the International Crops Research Institute for Semi-Arid Tropics (ICRISAT). He gave up almost all of his positions in 1971 in order to become the assistant director general and regional representative of Asia and the Pacific of the United Nations Food and Agriculture Organization. Because of his charisma we was responsible for IRRI’s entry into the People’s Republic of China and Vietnam and was sole responsible for North Korea’s re-entry into FAO. He retired from FAO in June 1982 but eventually became the special adviser to the FAO Director General. Not only was he scientifically inclined, he also had a charm with women, his students, his staff members, mentees, especially the farmers. He showed care and concern for his students and likewise, many circles of people from different walks of life. His colleagues remembered Dr. Umali’s rule, “When a farmer visits your office, stop everything you are doing and give him his due attention, for he is the primary commitment of your being in this institution.” Many have observed how he talked and dined with the driver, the secretary, the vendor, the waiter. Dr Umali headed and organized the Division of Plant breeding after his return to the Philippines in 1948. During his tenure as head, plant breeding bloomed into one of the most important fields in applied sciences in the country. Also in 1948, Dr Umali spearheaded the development of different varieties of Mussaenda philippica. Mussaenda philippieca is a variety of Mussaenda, a mostly ornamental flowering shrub found commonly in the African and Asian tropics. In the 1950s, Dr Umali was a part of the Abaca Varietal Improvement Program. During this program, Dr Umali was involved with several research projects about abaca. Dr Umali partnered with Dr James Brewbaker in order to fully understand the Musa species, of which abaca is a variety. Dr Umali identified relatives of abaca such as Pacol, “Agotay,” and Musa ornata as sources of resistance to abaca bunchytop and mosaic virus, the major diseases of abaca then and even up to now. Dr Umali and Dr Brewbaker made F1 hybrids of varying resistance against the diseases from crosses of abaca with their relatives. However, their F1 hybrids produced crosses that had good qualities for pulp and paper but not fiber quality. In 1949, Dr Umali engaged in the breeding and selection of superior rice varieties and the development of hybrids which were resilient to Philippine conditions. Nine years later, his efforts with these endeavours produced 14 outstanding rice varieties and five outstanding corn hybrids which were approved and recommended by the Philippine Seed Board. Dr Umali also valued the welfare of the farmers; because of this, Dr Umali studied the factors affecting rice seed dormancy and germination as well as milling recovery. Dr Umali recommended the improvement of the country’s rice mills because he first pointed out that the 40-50 percent milling recovery was due to inefficient kiskisan mills widely used in the country at that time. Dr Umali developed the local fruit germplasm as well as the local food industry. He developed different varieties of rambutan, durian, citrus, mangoes, tamarind, jackfruit, atis, manzanilla, and the golden coconut. Five commercial varieties of rambutan in the Philippines today were seedling varieties selected by Dr Umali. One of which even bears his name—the DLU Maharlika. The DLU Maharlika serves as the benchmark of high quality rambutan—sweet, juicy, and tuklapin which means the flesh is not attached to and is easily removed from the seed. Dr Umali showed a particular fondness for the genetics and production of makapuno, the endosperm mutant of the coconut. In 1953, he and his student L Zuniga showed that the inheritance of makapuno-bearing trees followed the Mendelian law by using controlled pollination of makapuno-bearing trees. Thus, the makapuno condition is gene-controlled. Since the makapuno nut does not germinate, it is not possible to obtain makapuno seedlings from the nut itself. Because of their efforts along with those of Dr Emerita V De Guzman, makapuno trees grown all over the country now have the potential to produce 100% makapuno nuts just by careful cross-pollination. He also established the Philippine Seed Board and the Rice and Corn Production Coordinating Council of the Philippines. He was also involved in the creation of the International Rice Research Institute (IRRI), the Dairy Training and Research Institute (DTRI) and the Agrarian Reform Institute (ARI). Undeniably, Dioscoro Umali did not only excel in the field of Agriculture but also in his academics, leadership skills, and notable social cooperation. He played an essential role in the society, his remarkable service contributed to the development of our Agriculture that which we all benefit from today. |Make an Appointment at Area Manila, 1000. Web. 25 May 2014. Science and Technology 2000. [Q 141/N38 2000]. D.H. Soriano and Isidro L. Retizos, n.d. Print. Scientists | Make an Appointment at Area Manila, 1000. Web. 25 May 2014. Sa Pilipinas." GMA News Online. N.p., 27 June 2012. Web. 17 May 2014. “Dioscoro Umali.” WikiPilipinas: The Hip ‘n Free Philippine Encyclopedia. N.p.,n.d. Web 17 May 2014. Legaspi, Edelwina C., Paz Eulalia Saplala, Teresita C. Vivas, and Paul Zarafalla. The Poor Man's Friend. Laguna: UP Los Banos: n.p., 1984. Print.